Thank you for taking the time to allow my readers to get to know better the life and philosophies of a World Champion. 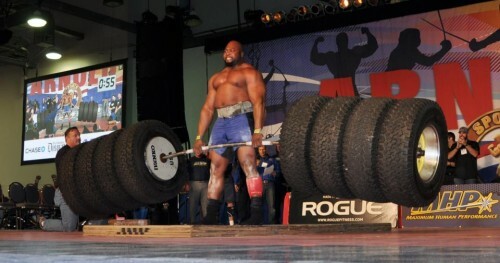 Congratulations on a new World Record of 1128lbs in the Deadlift just a few weeks ago at the Arnold Strongman Classic! It was an amazing feat of strength. Chris: Could you tell us about your upbringing, background and any details about your life before lifting and Strongman that you would like to share? My readers enjoy learning about the person behind the “name” and how their history has played a part in making them who they are. Mark: I grew up in Grenada, into a large family and left when I was 20. Chris: Could you detail your strength accomplishments and titles to date? Which of these are you most proud of and why? Mark: I stopped counting my competitions a couple of years ago as there were so many. I’m proud of my recent hummer deadlift world record. had a couple of 2nd’s at Europe’s Strongest Man over the years, IFSA British Chamption 2005, 2nd at Britain’s Strongest Man in 07 and 08. 4th at Worlds in 2006. Chris: Were you involved in other athletic pursuits growing up? Did you find yourself naturally driven toward strength related sports and training? At what age did you start to weight train and when/where did you begin your career in Strongman? Mark: Coming from the Caribbean I played Cricket from being very young. I started working for Carnival Cruise Lines when I was 20 as a bartender, so I started running whenever I had time off in the ports. I started weight training when I was 27 (whilst still on ships) and when I was 30 competed for Grenada in Bodybuilding. I used to train at Golds Gym (that was the norm in the ports we visited), and I would also train way down in the lower deck at the front of the ship with bits and bobs of discarded weights etc. I wonder if training the deadlift whilst at sea (needing to balance) made my back as strong as it is. We came to the UK in 1998 and I continued to compete as a Bodybuilder (but the natural BB scene wasn’t very big in the UK at this time so I was quite limited). Sept 2002 a friend of mine asked me to make up numbers in a strongman competition (that I’d never heard of), I came in 3rd winning 3 of the events against the best in the country at that time. 2003 I started to train Strongman (I loved it) and by 2004 I was competing internationally and had my debut at the Worlds Strongest Man where I came 7th. Chris: Did you feel support when you started the serious commitment that is commanded by high level athletic pursuits? Sometimes many of us feel part of the challenge is working in the training and commitment necessary while balancing that with the rest of our lives and with those in our lives. Mark: I was supported. I had always worked out since meeting my wife in 1993 so this was a natural progression, we only had one child at the time so my new strength training fit in well. Specific Strongman training was once a week where I would make a 2 hour drive to train outdoors with the various Strongman equipment, and 2 hours back. I later purchased this set of equipment so that I didn’t have to travel. Chris: When you were progressing did you have a mentor in the sport? Or anyone that you looked up to as example? Many of us reading this look up to you as an example of excellence in commitment to training and performance at the highest level. Mark: I didn’t have a mentor. It was pretty much trial and error with lots of time solo training. When I first started in the sport, I wasn’t aware of its history or athletes etc. so I learned as I went along. Chris: Who are your favorite competitors (past or present) either personally or competitively? Mark: Probably Marius (Pudzianowksi), as I’ve competed against him more than anyone else and although I never beat him overall.. I did beat him in certain events which always amused him. Always had fun with Phil Pfister (Note: Phil took 2nd place in my Mavrocat Production “The Strongest Man Alive” in 1997) through the IFSA days being a similar age. Chris: Where do you currently live and what is your current family situation? How has your family influenced your direction and success in the sport? 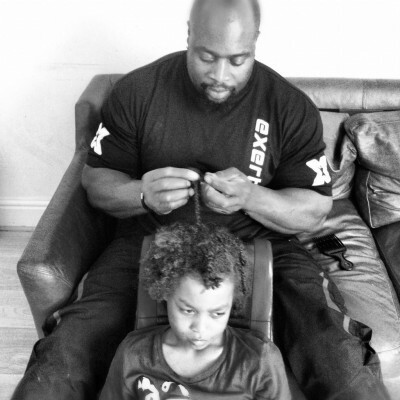 Are you strictly a professional Strongman or do you have a profession outside of the sport? Mark: I’ve lived in the UK permanently since 1999 and received my citizenship in 2007. I live with my wife and 3 sons in a small village in the country. I’m also a self employed plasterer (builder) so it fits in with my traveling. I’ve been sponsored by MET-Rx since 2008 so I can take time off even if I don’t do so well. Chris: Where do you train for Strongman and Grip work? What type of implements and equipment do you have where you train? How were they made or where were they purchased? Many aspiring Strongmen/women find getting a place to store and train with their implements to be an issue as they work toward getting stronger. Mark: People are often surprised I only train specific Strongman once a week (unless I have a competition coming up and then it might go up to 3 times if I’m not happy with something). I go to the gym 4 times a week split bodyparts with weights. I have performed deadlift specific training every couple of weeks (coming up to competition) with the recently deceased Alan Fairclough at Adlington Barbell Club. and I have a few younger training partners who come up once a week. Since August I have also had a personal trainer once a week (ex SAS Rob Edmond.. trainer from the UK version of the Biggest Loser). I didn’t realize how unfit I was.. my endurance and stamina has increased so much in the past 6 months! I wouldn’t have believed it was so beneficial to strength training. Chris: We have all had struggles at various points in our lives and most of us have struggled through our athletic career in one way or another. Have there been points where you struggled during your athletic career in any way (physically, mentally or otherwise) and how did you handle it? Do you have any general advice from your experience that might help us non World Champions when we are struggling? 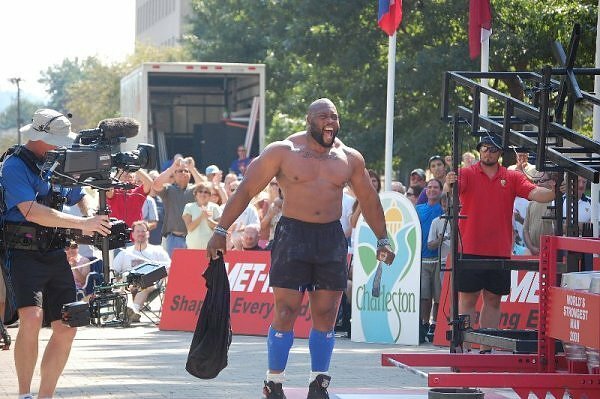 Mark: I struggled in 2008 when I tore my bicep on the Atlas Stones in the Qualifying round of the Worlds Strongest Man in Virginia. Luckily enough, IMG had me in surgery the following day getting repaired. This did affect me mentally, I had lost out on the Final of Worlds Strongest Man because of injury (this was my first injury). I was out of action for 6 months, off work for 3 months, couldn’t drive anywhere, had to rely on my wife for everything and felt guilty because she was also taking care of our 3 children. I think the only thing that kept me sane was keeping the video diary. It’s nice as I often get messages from people all over the world with bicep tears etc. thanking me for these videos and giving them something to work towards. I also tore my calf last year whilst warming up. I had pretty much 6 months off of Strongman because of not taking enough time off when I did it originally. Chris: Was there a specific point in your career when you knew you had a bright future in the sport? Mark: Yes on the first day of that first competition in 2002, when everything came naturally.. and the guys that had already been to Worlds Strongest Man (that I had just beaten) told me this is what I needed to be doing. I loved it and was hooked immediately. Chris: The sport of Strongman in the U.S. really grew and took hold in the mid to late 1990’s. 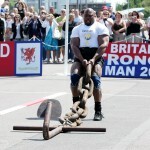 How long has the sport been active in England and how would you characterize the current state of English Strongman? 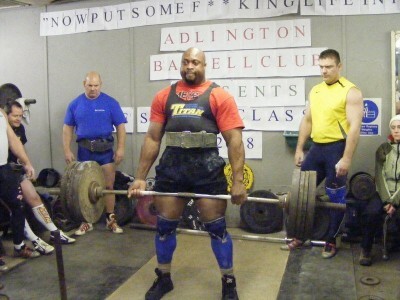 Do you feel that there are things that American competitions and American Strongmen could learn from the sport in England? Mark: There’s a lot of politics involved in Strongman.. always has been as far as I know. I just know I love the sport and I love to compete. I will compete wherever I’m invited, although now I do have to choose wisely (monetary wise) etc. because you can only compete so many times without injury. 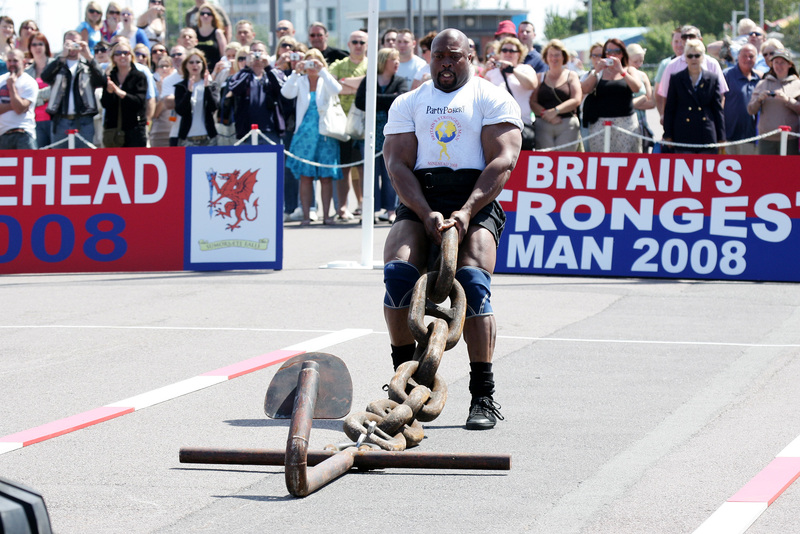 IMG (who owns the Worlds Strongest Man) also used to film Britain’s Strongest Man, I competed in 2004 and made the final in 2007 and 2008 (where I came 2nd). In 2005 I took part in the IFSA British Championship and won. I’ve competed in the States too many times to count and love to compete in the LA Fit Expo every January for Odd Haugen of Dotfit.com. Chris: Are there any aspects of the sport that you feel could be improved? Do you see any impediments to the sport growing stronger and gaining an even broader audience? Is gaining greater exposure something that you would like to see? Mark: I would like the sport to have more exposure and have had some fantastic opportunities as it is, I prefer the entertainment aspect rather than trying to push it into a “sport”, as we already have so many “strength sports”. I think Strongman is on its own because there are no restrictions. 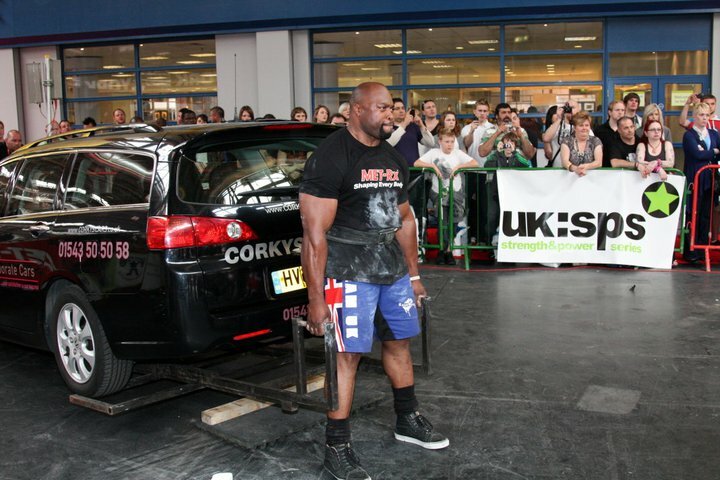 Chris: How long do you expect to continue to compete as a professional (in both Strongman and Grip Competitions)? What are your major events coming up this year? Mark: I’ll compete as long as I’m able. I’m still beating PR’s and world records and I’m quicker, healthier and stronger than I have ever been so who can say? I’m off to Brasil in April for the Arnold Strongman Classic there.. the last time I was there I came in 6th in 2005 at the IFSA World Championships. I would be hoping to stay injury free and make it to the Worlds Strongest Man after missing out last year but I know other things can come up. 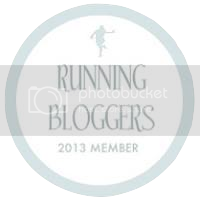 Chris: A part of my blog is bourbon and scotch reviews (I have always been a fan of English beers as well ever since I lived in Belgium and Sweden in the early 1990’s!) 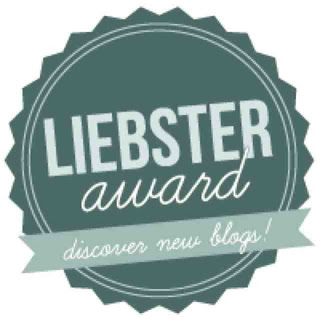 because I enjoy sampling for my readers and believe that with all of the hard work that we put in to becoming our best, we also should take the time to celebrate. Do you have a favorite drink to celebrate with? Mark: I do enjoy the occasional Guinness. Thank you so much for this interview. I guarantee that my followers have enjoyed reading and will benefit from your responses! 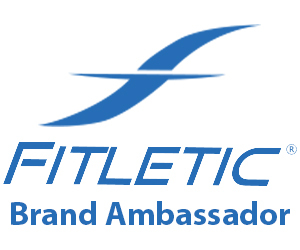 If you would be willing, I would like to do a second interview where we can go into detail on your thoughts on training methods and philosophies, nutrition, supplementation and competition strategies. I am certain you have much to share on these subjects. This entry was posted in Interviews, Powerlifting, Strongman on March 25, 2013 by Chris M.